I’ve been following the development of House Of The Dying Sun for a couple of years. Even back then, when it was still called Enemy Starfighter, it had already been in development for quite some time, and the reason for this is that it’s mostly the work of a single ex-Bungie developer. 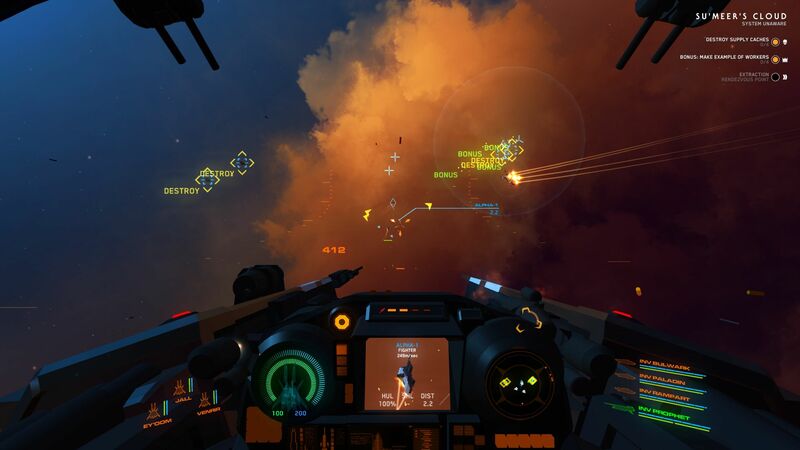 Up until, oh, just over a year ago, House Of The Dying Sun was a pseudo-roguelike arcade space fighter sim where you’d fly around a procedurally generated solar system with your AI-controlled fleet smashing things up and then warping out before powerful reinforcements arrived to smash you up; you’d farm renown through the things-smashing and use this to buy bigger and better ships, and then when you were ready you’d storm the enemy homeworld. However, this iteration of House Of The Dying Sun is a very different game to the House Of The Dying Sun that’s actually been released, which is a very short collection of bitesize scripted missions where you and your space fighter swoop into star systems to assassinate various targets of interest.